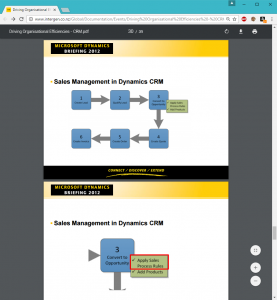 Browsing articles in "Dynamics CRM"
Shame on you, Intergen! You read about this sort of stuff but you never think it will happen to you — until it does. Just found out that a company in Wellington, New Zealand named Intergen has been using images and other content from my blog into the own presentations. They even call it “Diving into the Sales Pipeline”, which is the title of my blog series for when I used to be a Dynamics CRM consultant from where the content has been copied without my consent. You can find my original blog post here. Where I come from, we call this thievery. UPDATE: A digital marketing representative from Intergen got in touch with me. At first he was trying to “understand the basis of my claim” as he was looking an update post from 2013 that uses the same image. However the same image has been originally used in a post from 2011. I was pretty enraged at this point, since the representative was wondering “if the two images [I] refer too [sic] came from Microsoft”. Once we established that the images were mine, I got a response that the file has been removed. I got no apology whatsoever, but I did get an entire paragraph devoted to deflecting responsibility for the theft, and a request for this post to be removed. Since you are still reading this post, I am sure that you can guess what I think of their request. I’ve been postponing the writing of this post long enough, but I think I owe the readers of my blog an explanation as to why there is so little updates on Dynamics CRM coming from me. So here is my long and overdue update. In Dynamics CRM, no entity tends to cause more confusion to like the Lead entity. I do get that newcomers to CRM might be confused, and after many training sessions and constructive feedback I reckon I came up with a nice approach to explain the importance of this entity. Most people get it, but some companies still decide not to use the lead entity. Sometimes they genuinely don’t need to use it; but quite often then don’t use it because they don’t understand the true potential of leads. I’ve been getting some emails from readers praising some of the tutorials I wrote round Dynamics CRM customisation and wondering if I have any further tutorials planned. As a matter of fact I do – or perhaps I did. Upon examining some of the topics I was hoping to write about, I came to a poignant realisation: The vast majority of subjects I was hoping to write are about how to circumvent limitations of the Dynamics CRM platform. As I investigated these limitations on forums, blogs and other sources about Dynamics CRM I can only conclude that Microsoft is doing little to nothing to address most of these concerns. I’ve been working with Dynamics CRM for years and I’m starting to feel as if Microsoft might be in denial about some of the feature requests they receive on Microsoft Connect website.